Very fast trills and tone repetitions, as they are usually required in piano solo repertoire, can only be realized today on grand pianos with the double repetition actions. The actions of upright pianos are still too slow for this and therefore unsuitable. 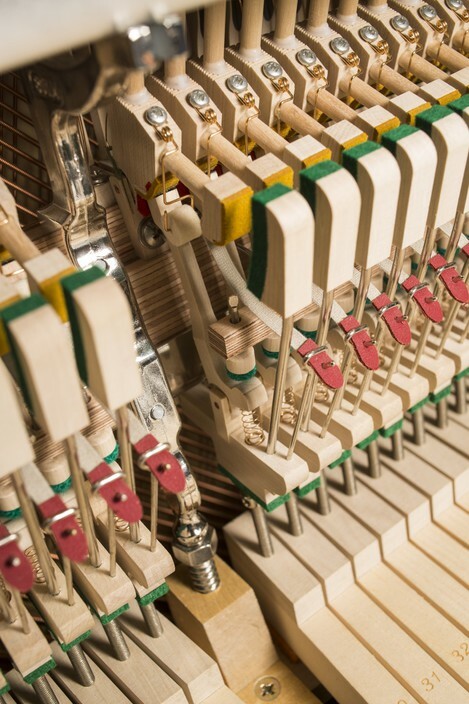 With its patented "High Speed KAMM Action", the Vienna-based company Feurich has found a way to enable the fastest repetitions even with upright piano actions. The aim of this Innovationsscheck is to develop scientific methods for recording the mode of operation of this mechanical innovation and, as a result, to identify and implement possible improvements in material and function. In addition, subjective assessments of pianists will be validated by these quantitative measurements. High Speed KAMM Action built into a Feurich upright piano.